The Paris Summit in December 2015 is being seen as the “last chance” to save the world from the worst ravages of climate change, yet whether the international community can reach a new climate change agreement remains to be seen. The United States and China, the two biggest economies and largest emitters of greenhouse gases in the world, hold the key to the success of not only the Paris Summit but also long-term global efforts to combat climate change. Thankfully, unlike most aspects of Sino-U.S. relations where tensions are rising, bilateral cooperation on climate change has made remarkable progress, highlighted by the historic climate change agreement signed by the two countries in November 2014. During Xi Jinping’s first state visit to the United States last month, the two sides announced a new set of policies to combat climate change, including a national cap-and-trade program in China and a $3 billion fund from China to help developing countries curb global warming. The remarkable success in Sino-U.S. climate change cooperation can be attributed to a wide arrange of factors, including growing domestic pressures, stable and flourishing non-official exchanges, and a change of attitude towards some of the key climate issues, to name but a few. Nonetheless, the solid foundation which has been laid on bilateral energy cooperation, clean energy in particular, is the key driving factor. However, relying on the energy sector alone is risky, and efforts in the energy sector might not be sufficient to sustain Sino-US climate change cooperation and curb global warming. The two countries’ commitment on clean energy should not be taken for granted. In the U.S., the Obama administration certainly has put curbing fossil fuels top of its policy agenda and has made very real efforts to enact policies and regulations to achieve these goals. However, whether those measures can survive political opposition remains uncertain. The 2016 presidential election could be a critical moment in the trajectory of U.S. climate policy. Moreover, the shale gas revolution not only enables the U.S. to achieve energy self-sufficiency, it may also make America the world’s top exporter of fossil energies. This means energy security concerns might no longer be the top policy issue for the United States, which could then weaken the government’s commitment towards developing clean energies. In the case of China, the current economic slowdown, if it persists, could force the country to rethink its ambitious plans for carbon emission reduction. For years, the bottom line for China on climate change mitigation has been to strike a balance between economic development and climate concerns. While in recent years, amid rapidly worsening pollution, China has been more willing to take decisive action such as breaking away from cheap coal and closing down energy intensive factories to curb domestic greenhouse gas emission at the expense of economic growth. However, it does not mean that climate change concerns will prevail over economic development. With hundreds of millions of people still living in poverty and per-capita incomes lagging far behind those of the developed countries, China’s development needs are immense and the government’s top priority is to maintain stable growth. Therefore, if the economic situation in China worsens, it will be no surprise if the Chinese government retreats from efforts to curb emissions in favor of stabilizing economic growth. In seeking potential areas to expand Sino-U.S. climate change cooperation, agriculture offers great potential. For starters, agriculture is both a major contributor to and victim of climate change. On the one hand, while the exact contribution of the agricultural and related sectors to total greenhouse gas emission remains debatable, studies show that emissions generated by agricultural and related sector activities could be much higher than the public perceives: The overall food system could contribute 25-50 percent of global greenhouse gas emissions. Therefore, reducing agriculture’s GHG emission should be central to limiting climate change. On the other hand, agricultural production and the food system are highly vulnerable to climate change. Certainly, global warming is not uniformly problematic – it could lead to improved productivity in certain tropical regions and extend the cropping period or allow multiple harvests in temperate zones. For the world as whole, however, climate change poses a dire threat to agricultural production and global food security, an assertion widely supported by findings from numerous studies. Climate change will trigger or exacerbate global food insecurity, which might eventually lead to hunger, famine, social unrest, the rise of terrorism, and refugees. Next, as the biggest agricultural producers and traders, the U.S. and China are also among the world’s top agricultural emitters. This highlights the critical role the two countries have in reducing greenhouse gas emissions from the farm sector. Moreover, unlike Canada and Russia, where agriculture may well benefit from global warming, the impacts of climate change on the agricultural sectors of both China and the United States are negative. Extreme weather brings uncertainty to future food production and threatens food security. China and United States are already deeply locked in the food-climate nexus, given their strong agricultural ties. Those close ties bring both opportunities and challenges to the efforts of the two countries to deal with climate change. On the one hand, given that China’s farm sector is heavily reliant on fertilizers, pesticides, and other chemical inputs and is dominated small household farming, importing soybeans, corn, and other agricultural products from the United States, apart from contributing to China’s food security, allows China to implement its afforestation and land restoration plans, which are important steps in reducing greenhouse emissions in China. On the other hand, close agricultural ties also mean that the climate impacts in one country will have repercussions for the other. To take a somewhat more obscure agricultural product, alfalfa, as an example, the United States, the largest alfalfa producer in the world, accounted for nearly 95 percent of China’s total alfalfa imports in 2012. 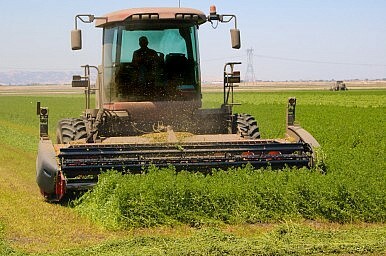 As alfalfa requires substantial volumes of water, the Sino-U.S. alfalfa trade has come in for criticism amid a historic drought in Californian the largest alfalfa producing region in the United States. The potential climate impact of the evolving Sino-U.S. agricultural ties would not be limited to those two countries alone; rather, the whole word could be affected. The United States has long been the biggest supplier of agricultural products to China. Increasingly, however, there are concerns in China that an over reliance on U.S. for food will jeopardize China’s food security and even its national security. Thus, China has been pursuing a diversification strategy. This is especially the case with soybeans. In the late 1990s, China imported more than 80 percent of its soybeans from the United States; now, it is importing more soybeans from Latin American countries, particularly Brazil and Argentina. In 2014, the U.S. share of China’s total soybean imports declined to about 40 percent. While diversifying imports away from the U.S. is beneficial to China’s food security, it has negative repercussions for global climate change mitigation because China’s soaring soybean imports from Latin America are contributing to deforestation in the Amazon, considered to be the biggest carbon sink in the world. As deforestation progresses, it releases carbon, with a direct impact on the entire world, helping to drive climate change. The U.S. and China should prioritize agricultural and food security in their bilateral efforts to combat climate change. The two countries could play a major role in shifting agriculture from being part of the problem to being part of the solution to climate change, by expanding bilateral agricultural trade and investment cooperation, stepping up efforts in agricultural research and technology, and strengthening global food systems. Zhang Hongzhou is an Associate Research Fellow with the China Programme at the S. Rajaratnam School of International Studies (RSIS), Nanyang Technological University, Singapore.